Follow link and scroll down for the whole story. Everyone remember this frame? It is our new MTB proto frame with IRD/Tange sliding dropouts. That bridge is on the fire road on the last bit of the Downieville downhill trail, which is a 17 mile, mostly downhill trail ride that really tests your endurance and bike handling prowess (located in beautiful Sierra County, CA in the town of Downieville). It is mostly twisty, tight singletrack with a few bursts onto jeep trail out in the middle of the beautiful Sierras. The frame handled beautifully, stable enough to handle flying over the braking bumps carved out by years of abuse from armor-clad downhillers. We ran some 2.24 MutanoRaptors on the full rigid setup to give a little cushion against the harsh, wheel-eating braking bumps and rock gardens (after riding similar trails in places like Whistler and Northstar on a full DH bike, you forget what an extra 7 inches of travel lets you get away with). The rigid single-speed setup keeps things real. The fork is the 453mm axle to crown IRD rigid fork, designed to 26" wheel frames made for 100mm suspension forks. (It is also a nice fit for our 650b B-Side frame which is designed for 80mm travel version of White Bros. 650b sized fork. ) The taller front end climbed fine (no excessive wandering) and really helped keep both wheels moving when hitting an unexpected root or rock at speed. You don't realize how exhausting riding down the hill is until you have spent two hours doing it, but at t he bottom the only thing to be done was grab pizza and beer and head into the brisk North Yuba river for a little cool down. We were definitely a bit of throwback- 3 of us all riding rigid single-speed (incidentally, all Soma frames) in full Lycra kits in a town full of baggies, armor and suspension. You got the sense that most of the guys in the shuttle didn't think we would make it back down in one piece, much less pass up folks with all mountain bikes (yes, we shuttled up. A few years ago we road the fire road to the top, and the 5000 foot, 11 mile climb hurt. Real bad). A really fun trip, especially when coupled with a campsite full of good people and gorgeous weather. Back in the office, we have been getting new stuff every week. 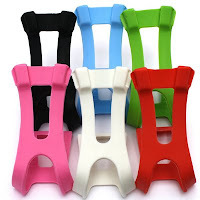 We just got the following awesome items up in the SomaShop for your purchasing pleasure: Soma Colored Spokes, Pake Nylon Toe Clips, Dia-Compe Gran Compe Shot Levers in colors, Dia-Compe Gran Compe hubs in colors, Dia-Compe Gran Compe tires in colors (check the purple! ), and KMC dual color chains (black plus either red, orange, yellow or white). Punk rock. 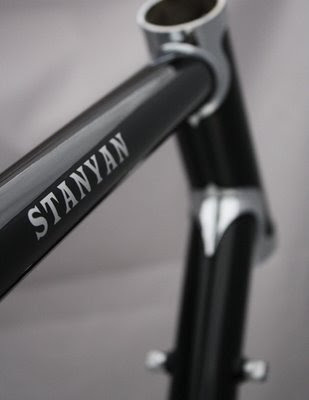 The Stanyans (formerly the Speedster) have arrived in all their black, silver and chromed glory. This is our lugged CrMo road sport frame/fork set (perfect for centuries and multi-day charity rides). We will try to get info and more pix up on the website soon, but shops can order from Merry Sales this week. 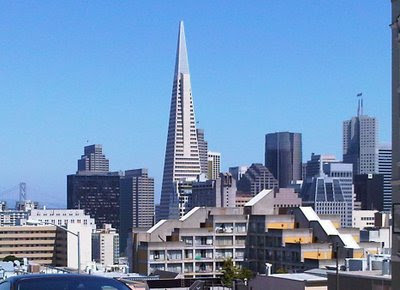 We named it after Stanyan St. in SF, because the street is historically known for its many bicycle shops. It used have at least 7 bike shops all in the four-block area where it borders Golden Gate Park. 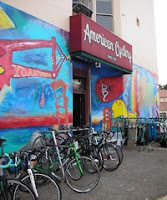 American Cyclery, Too used to be San Francisco Cyclery which is where I got my first road bike, a turquoise blue Schwinn Varsity. There were also Lincoln Cyclery, Start to Finish, and Vision Cyclery. Avenue Cyclery also owned a second shop in the area, but the name escapes me. Great little spot in the city. Close to all the fun shops and eateries on Haight Street and just cross the street to test ride your bike in Golden Gate Park. A new shipment of Buena Vista's has arrived and we will be shipping backorders shortly. Thought this was a good time to share one Buena Vista story with you. 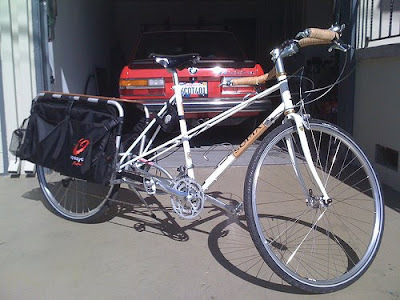 Maynard Rabara is the proud owner of a Buena Vista mounted to an Xtracycle Free Radical. He calls it "Stretch II". I'd shopped around for several step through's and mixtes, discovering that most modern frames were bland or ugly (with the exception to a few, like the Gary Fisher Simple City), and that vintage ones were weak (my initial build was a Fuji S12S mixte) due to their lower grade steels and thinner tubing; causing too much flex when the Free Rad was loaded. Most of the stronger ones (Reynolds or Columbus quality) were harder to come by used. Other retro modern frames like the Rivendell mixte, Velo Orange or Ibisu were way out of my price range. The BV was just what I needed in terms of budget and quality of steel and rigidity. I had a (Reynolds) Double Cross that I could have used, but again, I wanted a frame that I could step through. 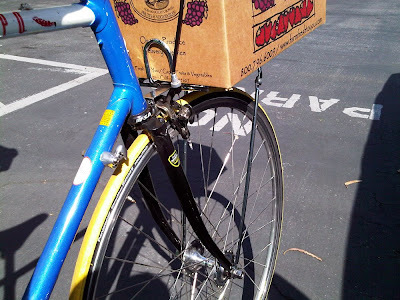 Now the bike sees weekly grocery duty, and as soon as my daughter can wear a helmet, I'll be shuttling her around town for doing daily activities and for hill rides." Here is a sneak preview of some Viva cloth tape we just got. It is made in Japan and comes with nice locking bar plugs (in black or white, depending on the color of tape). Colors, from left to right, top to bottom: Black, Purple, Marine Blue, Sky Blue, Red (it is sort of "strawberry" colored in person), Olive, Brown, White, Silver, Beige, and Yellow. We should have them up in the Soma Shop by Friday. 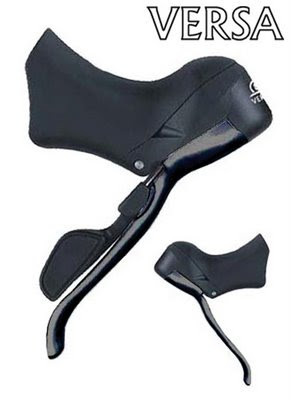 Also fresh in are the Versa 8 shifters, which work with Shimano Nexus and Alfine 8-speed internally geared hubs. This is a nice way to get the benefits of integrated brake/shifters with the durability and clean lines of internally geared setups. Dig the rack? It's a chrome-plated mini front rack with struts that attach at the axle (drilled for track axles, too). 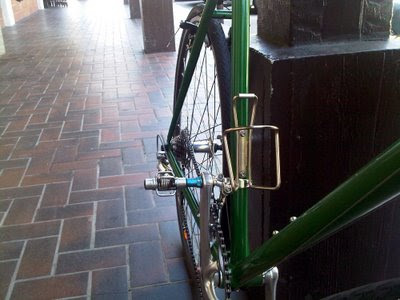 I like that there isn't a need for any mid-fork mounts or eyelets; I was able to take a classy looking rack and install it on a track fork in five minutes. 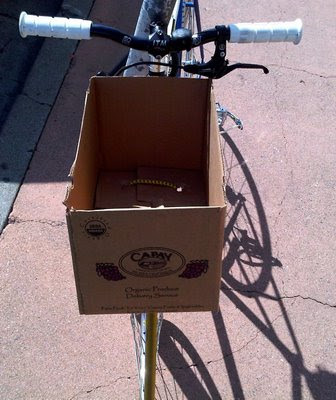 The box was installed with a box cutter and two bungee cords. Made my Saturday morning grocery run bag free. It is really pleasant, especially when it is warmer, to not have a bag on your back. Out enjoying the pretty weather on my Double-Cross, fresh from the powdercoaters. 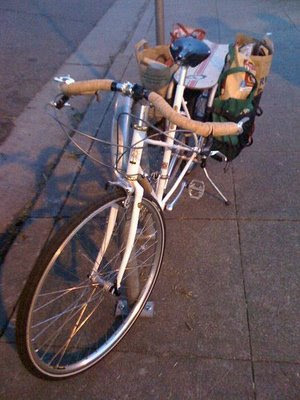 Come cross season it will get some white striated tape, making the bike that much faster. Locking alloy bar plugs- a classy way to round out some fresh bar tape.